Wow! What a fascinating book! 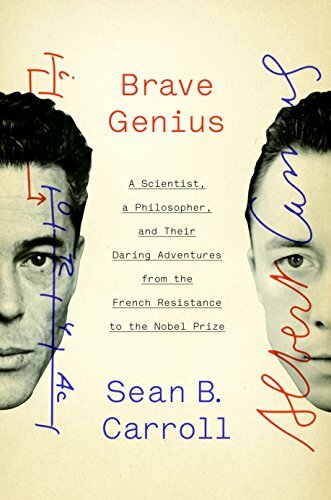 This is a dual biography of Albert Camus and Jacques Monod, both Nobel prizewinners--Camus for literature and Monod for physiology--but it's much more than a simple biography. It's a history book, a philosophy book, a science book just to name some of its constituent parts. Author Sean B Carroll does a terrific job in each of those areas. We've all read WWII history, but the special emphasis in Brave Genius on occupied France was especially enlightening for this late baby boomer. I was reminded of Irene Nemirovsky's Suite Francaise as I read the account of the Germans taking Paris. But whereas Nemirovsky takes you out into the French countryside when the Germans arrive, Carroll describes what happens when most people trickled back into Paris and had to figure out how to live with their new reality. Camus and Monod decided to become active members of the French resistance while still pursuing their occupations of writing and researching. They were both unbelievably brave and incredibly resourceful during the entire affair. Carroll does a splendid job not just with describing their lives, but explaining the philosophy behind Camus' works and the science behind Monod's experiments, making both equally accessible to the layperson. The science reminded me of a little of Siddhartha Mukherjee's "The Emperor of All Maladies," and truth be told Mukherjee's analogies were probably a little easier to follow, nevertheless, I found myself routing for Monod and his labmates as they untangled the web of how genes work. Oh, and did I mention the story about Monod's spiriting scientists out of Hungary after the Uprising or how Camus handled the French-Algerian Crisis? Yeah, all that's in there, too. It takes a skillful author to be able to weave all these threads into a coherent whole, but Carroll is more than up to the task.